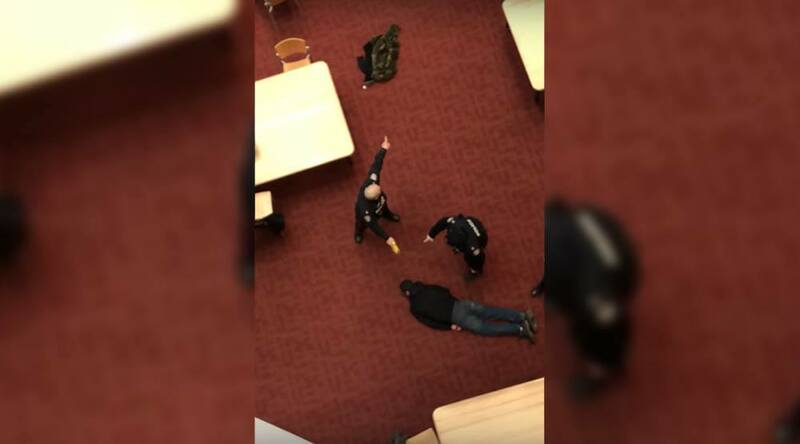 A man is facing multiple charges after allegedly threatening an officer with a knife and subsequently getting tased at a Toronto library earlier this week. On Monday, April 1, around 2:14 pm, Toronto Police received reports of a person with a knife inside of the Reference Library, on Yonge Street, north of Bloor Street East. Police say a paid duty officer nearby heard the call and responded. When the officer arrived, the man aggressively charged at her, asking her to shoot him, police told Daily Hive. Authorities say the officer called for back up and maintained a safe distance from the man, while advising patrons to do the same. In a dramatic video posted on YouTube by Amir S, an officer can be seen walking away from the accused and telling patrons to “get out,” as onlookers watched from the floor above. The suspect can be heard saying, “I’m not going to chase you like that. I’m telling you to point it at me,” and it appears he is holding an object in his hand. “I don’t want to. That’s not what I’m here for,” an officer could be heard responding. The man then appears to walk toward a group of officers, one of whom is holding a taser. Police told Daily Hive this officer as a police Sergeant. “Shoot, then,” said the accused while raising his hands in the air. The sergeant then shoots the taser toward the suspect, causing the man to stagger backwards before trying to walk away. The sergeant can be seen shooting the taser again before the man falls onto the ground head first. At this time, police can be seen telling a bystander to get back, while demanding the suspect put his arms out. Following the incident, the man was placed under arrest and was taken to hospital where he was medically cleared with no serious injuries, according to police. The man, who hasn’t been identified, now faces multiple charges including, threatening bodily harm and weapons dangerous. Police say he has since appeared in a Toronto court. There are additional videos circulating online of the incident, which can be seen below.